The claim: The NHS could recover between £200m and £500m annually from foreign patients if a system of charging them in advance for non-emergency care worked perfectly. Reality Check verdict: The NHS recovered £358m in 2016-17 and £500m is the government's target for 2017-18. The NHS may struggle to meet that target, but it is not unreasonable to suggest that amount could be recouped by a perfect system. NHS hospitals in England now have to charge patients from overseas up front for non-emergency care if they are not entitled to free treatment. 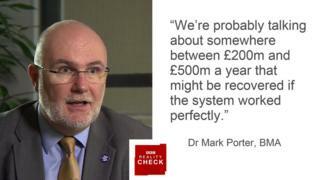 Dr Mark Porter, from the British Medical Association, told BBC Radio 5 live in February 2017 that the amount that could be recovered if the charging system worked perfectly was between £200m and £500m a year. He went on to say that was not very much money in the context of NHS spending and deficits, bearing in mind that the NHS budget in England was £116.4bn in 2015-16. A report - based on 2013 figures - estimates that treating all visitors and migrants in England (not only in hospitals) costs the NHS about £2bn, although it warns there is considerable uncertainty about that figure. That includes treating tourists who become ill while on holiday and longer-term migrants who have paid surcharges on their visas to be entitled to NHS care. Not all of that £2bn could be recovered. Treatment in A&E, for example, is free for everyone up to the point when a patient is either admitted to hospital or given an outpatient appointment. The government does recoup some of the £2bn, although not as much as it would like. It has a target to recoup £500m of the cost of treating overseas visitors by 2017-18. It has made considerable progress towards that goal, increasing the amount recouped from £97m in 2013-14 to £358m in 2016-17. A big proportion of that increase, £210m of it, has come from a health surcharge that must be paid by most students and temporary migrants from outside the European Economic Area (EEA) applying for visas to come to the UK for more than six months. Patients from inside the EEA with EHIC cards are generally treated free, with the government applying to their home countries to cover the cost. Those from elsewhere in the world who are not covered by the health surcharge will be charged for the cost of their treatment. Trusts are now allowed to charge 150% of the cost of treatment to patients from outside the EEA. The NHS has not been particularly good at recouping the costs in the past because trusts have not been good at identifying which patients should be charged for their treatment and it is difficult to collect money from patients living outside the EEA once they have returned home. The authorities have also not been particularly good at recouping the costs of treating people from EEA countries. This report from the National Audit Office from October 2016 said that on current trends the NHS would not manage to recover £500m a year by 2017-18, although that was before the announcement of the change to the rules so that non-urgent care must be paid for upfront. The NAO estimated that trusts only manage to recover about half of the amount they invoiced overseas patients. The Department of Health estimated that in 2012-13 the potentially recoverable amount was £367m, but it excluded from that figure the estimated cost of between £100m and £300m for a combination of people who had travelled to England purely to receive urgent treatment and regular visitors who are described as "taking advantage" of the system by registering for GP services and other NHS services to which they are not entitled. All of these figures are estimates. Looking at the bottom end of the range, £200m is too low a figure as it is considerably less than is currently being collected. At the top end, £500m is the government's target - it is not unreasonable to suggest that amount could be collected by a perfect system. This article was originally published on 6 February 2017 and updated on 23 October 2017 with the 2016-17 figures for the amount recouped. Dr Mark Porter ended his term as chair of the BMA in June 2017. NHS funding: Is £10bn rise really a cut?